Moneyball Rules: Offering More Experienced Workers Less Money! For years I’ve been trying to get people to understand this Moneyball concept as it relates to hiring, but few really listen. I know you saw the movie, Moneyball, where a major league baseball general manager finds success by signing and drafting ‘undervalued’ players. The players are undervalued for a number of reasons, it doesn’t matter, what matters he was able to get talent on at a discount rate! Don’t you want to hire employees at a discount rate!? 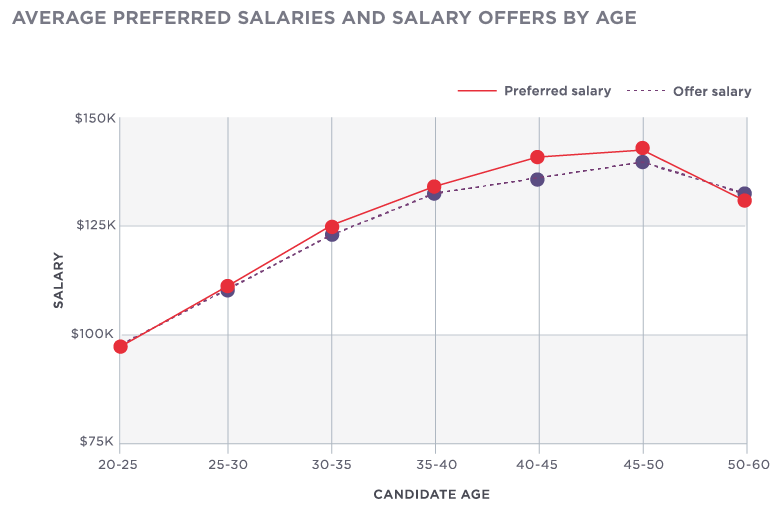 Basically, our average salary offer increases every single year of age. It makes sense because as you age, you gain more experience, more experience is more valuable. Or is it? The chart, also, shows that once a worker turns 50 years old or so, employers (but not you…) start offering those workers less money, even though they have more experience! This has nothing to with wages! This is pure age bias shown towards younger workers. We believe, even older hiring managers, that once someone gets to a certain age, and Hired.com shows us that age to be 50 years old, older workers start losing their effectiveness even as they gain experience. Somehow, in our minds, that 35-year-old, with three screaming kids and soccer practice four nights a week, is more effective than the 50-year-old with no kids at home, who is willing to work wherever and whenever you need them. So, now you can play Moneyball! You already know that most employers in the world hate old people. Thus, there are tons of gray hairs limping around out there willing to take all of your crappy low-ball offers, and they’re probably more loyal for those low wages then any younger worker you have on staff. Yeah, for capitalism! You get great talent at low rates. Who needs H1B’s when we have old people! Your reality is as hiring gets tighter, you can continue to overpay for younger talent with less experience, or you can pay a cheaper wage for more experience. Sooner or later, someone is going to ask the right questions. Are you going to have the right answer?